What Was The First YouTube Video To Reach One Billion Views? In The Original Batman TV Show, Batman's Utility Pouches Were Made Of? 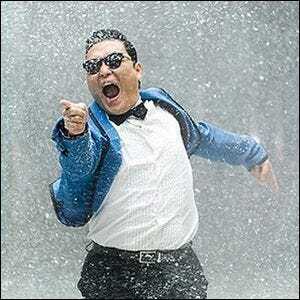 In the summer of 2012, South Korean popstar Psy released his 18th single “Gangam Style”. This particular song (and the accompanying music video) blended a catchy tune, fun dance moves, and over-the-top theatrics that quickly caught the attention of not just fans in South Korea, but, courtesy of YouTube, hundreds of millions of international viewers. The title of the song, repeated in the refrain, “Gangnam Style”, is a Korean neologism that refers to the very wealthy Gangnam District of Seoul, South Korea and the dress and behaviors of the people therein. While the neologism doesn’t have a perfect analog in American English, it would be like an American speaker saying “Hamptons Style” or “Beverly Hills Style” to refer to doing things in a super posh and wealthy way. The contents of the music video reflect this, with Psy dressed in formal wear at certain points, dancing in a horse stable, and otherwise wearing and doing things that flaunt wealth. The combination of the catchy lyrics and the theatrics of the music video proved to be a huge hit both inside and outside of South Korea. By the end of 2012, the song had topped the music charts in over thirty countries and become the single most viewed video in the history of YouTube—it broke the billion-view mark in December of 2012 and has since gone on to accumulate over 3 billion total views.